The Mumbai police have outlined how Pakistan umpire Asad Rauf, who was listed as a "wanted accused" in the chargesheet on the IPL betting scandal, was allegedly given gifts by bookies, passed on match-related information to them, and placed bets on matches himself while officiating in the tournament. The police made their case on the evidence of transcripts of recorded phone conversations that Rauf allegedly had with other people accused in the chargesheet, and a large portion of it concerns the period before and after the Delhi police arrested three Rajasthan Royals players following their match against Mumbai Indians, which Rauf umpired, at the Wankhede on May 15. The chargesheet also brought out an alleged link between actor-punter Vindoo Dara Singh, one of the accused, and Rauf through recorded phone conversations. Vindoo was also alleged to have close links with former Chennai Super Kings official Gurunath Meiyappan, who was charged by Mumbai police on Saturday with cheating, forgery and criminal conspiracy - including passing on information that compromised the team. "A telephonic conversation between Randhawa [Vindoo Dara Singh] and Rauf at 08:55.14 on May 14 is available. It has a mention of a gold chain gifted to Rauf by wanted accused Sanjay Chhabra alias Sanjay Jaipur and Sandeep Chhabra alias Pawan Jaipur," the chargesheet said. "Two witnesses have provided additional details in this regard. "At 13:29.44 on May 15, Rauf is heard telling Randhawa in a conversation, "Aaj zindagi ki haar-jeet kar lena [Tonight you can make or break your life]". Immediately after the call, Randhawa called Sandeep Chhabra alias Pawan Jaipur and is heard telling him Rauf has asked him to place huge bets on the said match and all the gifts they have awarded to Rauf will pay off in tonight's game. This is available in the conversation that took place at 15:41.31 on May 15. Rauf was appointed as umpire for the match between Mumbai Indians and Rajasthan Royals on the said day and he is heard telling others to place bets on the match. "At 17:30 on May 15, a conversation is available about Sanjay Chhabra alias Sanjay Jaipur calling Asad Rauf and saying, "sham ko wohi cheez karenge jo aapne batayee [In the evening, we will do exactly as you have told us]. "Following the player arrests in Delhi, wanted accused Sanjay Chhabra alias Sanjay Jaipur called Rauf from the number of witness Mahesh Mishra at 19:56.52 on May 16 and asked him to destroy the sim card that was given to him. Later, even the conversation of Randhawa instructing the same to Rauf is also available. 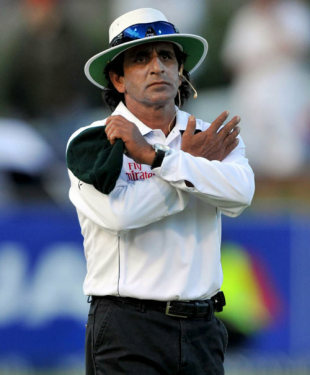 The conversation about wanted accused Asad Rauf placing bets on cricket matches at 22:00.03 is available with Randhawa. The said conversation also mentions the detailed amount and the teams that Rauf has placed bets on." The chargesheet also contains details of alleged gifts Rauf may have received from bookies and evidence indicating he met with others accused in the case. "As per information provided by accused Prem Taneja, two bags that were to be delivered to Asad Rauf were taken into custody from Air India cargo department at the Mumbai airport. The bags included gifted apparels, shoes and other accessories, shopping bills at Diesel showroom, Asad Rauf's pass and bills in the name of Asad Rauf Malik. "The footage of Asad Rauf shopping with Prem Taneja at a Diesel showroom has been acquired on May 26. Witnesses Samira Suresh Avdhun, Mushir Rashid Khan have admitted in their statement that for the shopping on April 25 and 26 that Rauf did, Taneja paid the bill while the May 14 bill was paid by Rauf." The Mumbai police had not been able to question Rauf in relation to the case because he had left India during IPL 2013. Rauf had returned to Pakistan where he held a press conference and stressed that he had not engaged in any corrupt activities, a stance he reiterated on Saturday after the chargesheet was filed.